In earlier sessions you saw how to put text in the windows clipboard (Putting Text In The Windows Clipboard) with the help of PutInClipboard() and Data Object and how to get the text from the Clipboard using GetFromClipboard() and Data Object. In this session you will learn how to store multiple data’s in Clipboard and retrieve them. For storing multiple data’s, you need to store values as pair, Keys and Values or you can say format identifier and while retrieving the data from the Clipboard you will use these format identifiers to get the data. This data can be String, Long, Integer. For storing multiple data in Clipboard, Follow the below steps. • Initialize a String and an Integer. Initialize a String and an Integer. 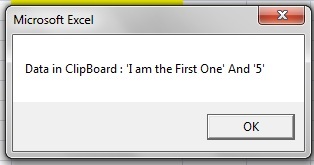 strText = "I am the First One"
MsgBox "Data in ClipBoard : '" & objData.GetText("StringOne") & "' And '" &   objData.GetText("IntegerOne") & "'"
Note: For work­ing with Win­dows Clip­board you need DataOb­ject, the object in MSForms library. It pro­vides sup­port for text-string. VBA-Excel: Add/Insert multiple objects from a folder in an Excel Document. I do believe all of the ideas you’ve preseented to your post. They’re really convincing and can definitely work. Still, tthe posts are too short for beginners. 216 queries in 0.096 seconds.